Although I am away on vacation, that doesn’t mean that I can’t post! Today’s video is the perfect topic to discuss because it’s all about getting packed for a Summer getaway! Today I am coming at you with the second video in the Get Packed With Me series that I started earlier this year! Its more developed, and has a lot more direction, so I am pretty excited to show you guys some more content! 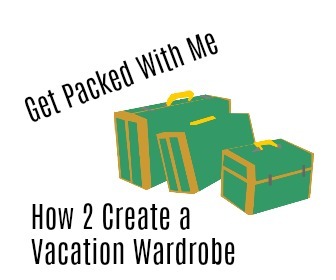 Each Get Packed with me video will have a topic, and today’s is all about building the perfect vacation wardrobe! So grab your passports, and watch the video below! I hope you have enjoyed the video! If you liked it and want more in this series leave your ideas in the comment section below! You can click here to check out the first video in this series. Let’s recap what we learned today! Organization is always critical when it comes to pretty much anything! I find that if I write it down, I don’t forget it, so a packing list saves the day every time it’s time for me to travel. I jot down the types of outfits I need, and then from there, I start to pull things from my closet. Once that’s all done if I notice I need a couple extra pieces I make a shopping list so that I can grab what I need, and not what I don’t need. When building the actual wardrobe remember to keep these four points in mind. Be sure to pull up your favorite weather app( or channel) and check out the weather during the week to the place you’re traveling to. This allows you to know what kind of outfits you need to bring and will help you be prepared instead of having to run around and find something to switch up the looks. Never assume, always check! Every vacation and trip are different, so you want to make sure you are bringing the type of clothes that cater to the kind of trip you’re going to. There’s nothing like showing up to an event or gathering, and you’re underdressed, or overdressed. Determine what kind of clothes you need, and let the creation of the outfits begin. You want to make sure that you leave some room for whatever you may purchase while you’re gone, so don’t choose pieces that are too thick. Limit them to 1-3 and watch all the space clear up. I can’t stress enough how important it is to try things on! If you skip steps 1-3, that’s cool, but this step you CANNONT skip! Since you don’t have the option of swapping things out while your gone, you need to try everything on before you pack it. That way you know exactly what your outfit looks like, and there are no surprises and OOTD’s that you are secretly hating. So, ladies, that’s all for today’s blog post. If you want to see what I’m wearing on vacation be sure to check out my social media! I have posted plenty of OOTD’s! My social media is linked all above if you are interested! Be sure to come right back here on Friday for another blog post! I love you lots like tater tots, and I will see you all on Friday!